After their successful teaming in the Gothic monstrosity What Ever Happened to Baby Jane?, both Bette Davis and Joan Crawford found twilight career success in a run of horror films of varying standards. They were invariably made in Britain, which at that time (the late 1960s) played host to a number of cheap and nasty shockers of no real distinction. 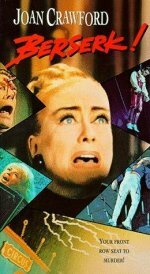 Here Crawford stars in a tale about murderous goings-on in a circus that is at least marginally better than her caveman fiasco Trog. She's backed up by some interesting faces, ranging from Ty Hardin to the ever-welcome Diana Dors.